"...After Athicus had been marched away to be formally arraigned before a magistrate, this jailer made the rounds of the cell as a matter of routine. 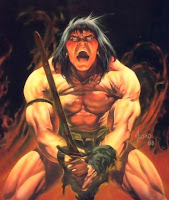 As he passed that of Conan, his sense of propriety was shocked and outraged to see the prisoner free of his chains and in the act of gnawing the last shreds of meat from a huge beef bone. The jailer was so upset that he made the mistake of entering the cell alone, without calling guards from the other parts of the prison. It was his first mistake in the line of duty, and his last. Conan brained him with the beef bone, took his poniard and his keys, and made a leisurely departure..." Read the entire short story here.